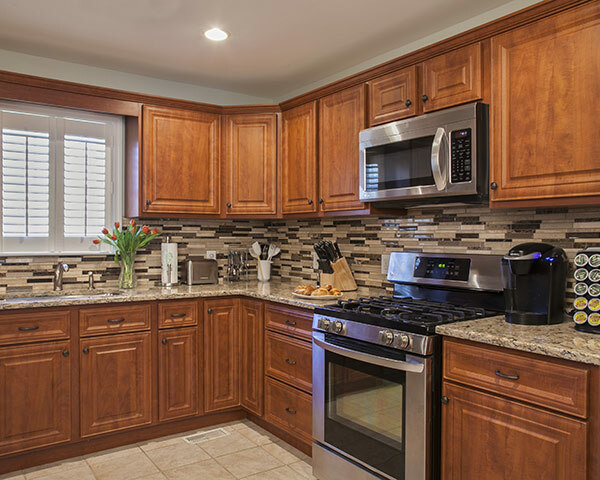 Technological improvements have allowed laminate cabinets to advance into a product that not only rivals real wood, but in many ways surpasses it in terms of maintenance, durability, longevity, and price. Advances in design have resulted in the ability to create exterior veneers that look exactly like wood. Meanwhile the development of durable materials has resulted in maintenance-free cabinet exteriors that can be easily wiped clean, without an iota of damage done or further upkeep needed. The main downside to wood is it can require a bit of care. Wood has the potential to warp, stain and split if it isn't properly maintained. This requires regular washing with warm water and mild soap and may also mean oiling or refinishing on occasion. If you love the look of wood but need more of a "spray-it-with anything-wipe-and-go" kind of kitchen, laminate is the way to go. However, as you consider laminate cabinets, be aware that not all laminate is created equal. You will still find versions like the particle board offenders we mentioned earlier. The best quality laminate cabinets are made from what’s known as “MDF”—Medium-Density Fiberboard. If you make the choice to go with laminate cabinets for your kitchen, you’ll want to keep an eye out for those three letters. The difference in value is night and day between particle-board and MDF. Who Knew These Laminate Cabinets Weren’t Real Wood? Laminate has deceived many people into believing they were looking at real wood. Believe us, your guests will be none the wiser! Here are 7 kitchens with cabinets that I was surprised to learn weren’t real wood. 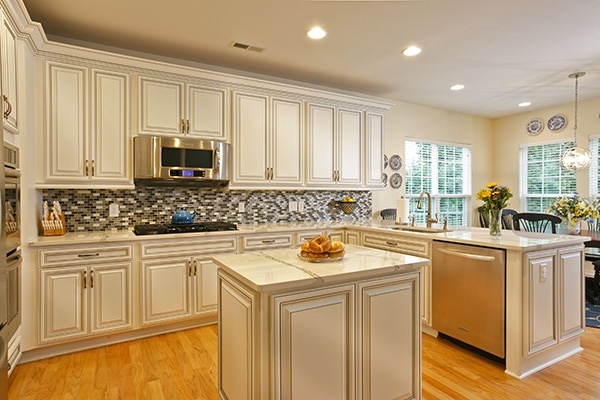 Laminate is the ideal cabinet exterior for white cabinets. White is the most popular cabinet color, but it also takes the prize for most likely to show fingerprints. So, more than ever, that maintenance-free surface is going to be your best friend. 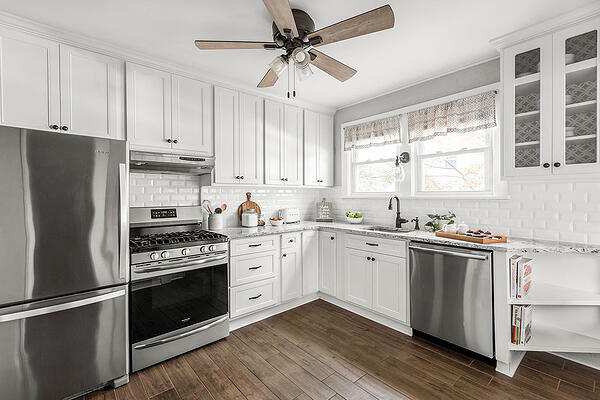 With wood cabinets that are painted white, you are limited in how you can clean them, and the wood is still susceptible to warping and the like. Yes-way! These cherry-toned cabinets are laminate, but I was totally fooled and thought they were wood. The intricate details of the raised-panel door help to pull off the ruse. But, the warm coloring and realistic grain are just the cherry on top! 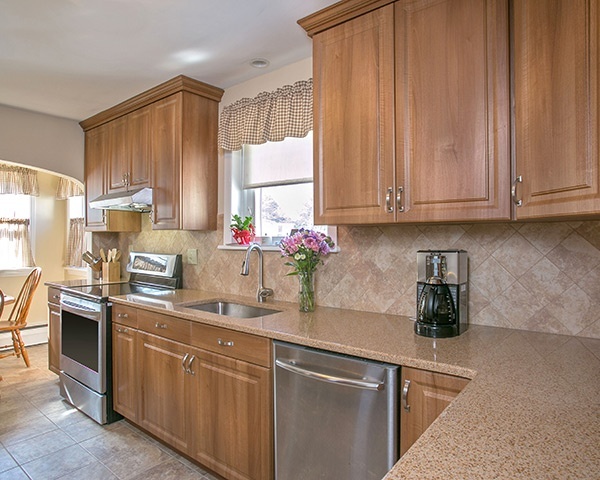 This quaint galley kitchen features a warm Tropical Mahogany finish that would trick even the most avid designer. Each and every wood grain within the outer veneer mimics true mahogany wood, creating depth and incredibly convincing visual appeal. 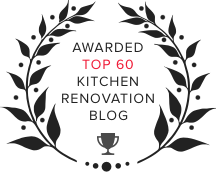 The result is a showstopping kitchen that the homeowner paid a fraction of what they would have paid for true wood cabinetry. 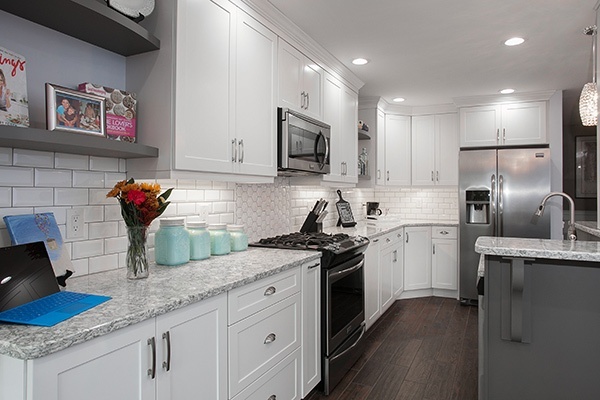 For the same reasons we explained for white cabinets, laminate is perfect for gray cabinets. 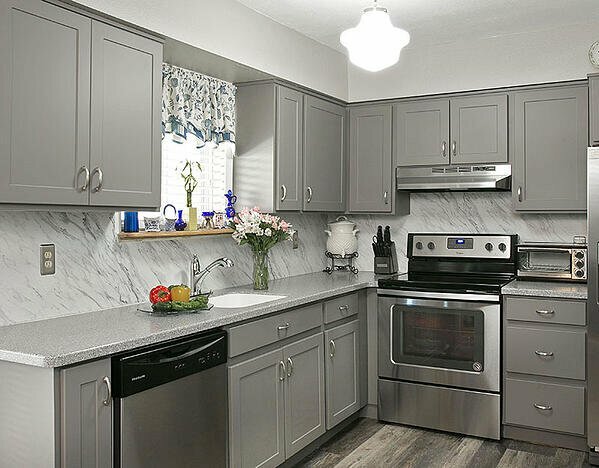 Gray is a flat color, so dirt and fingerprints that accumulate in any kitchen will be more visible than they would be on a varied wood-grain surface. This is another situation, like white, where the wood counterpart is going to be painted gray. 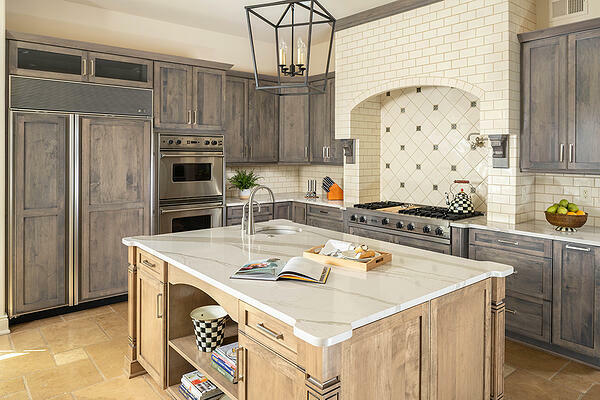 Even professionally painted cabinets are going to require more maintenance, and they just won't be as durable or resilient, as high quality laminate cabinets. This is really exciting, because if you like that reclaimed wood look, then you may or may not be familiar with the cost associated. It's super-pricey. But, guess what? Laminates that look like reclaimed wood tend to cost the same as laminates that look like traditional wood. So, go ahead—get the rustic look you've been dreaming of and do it within your budget! 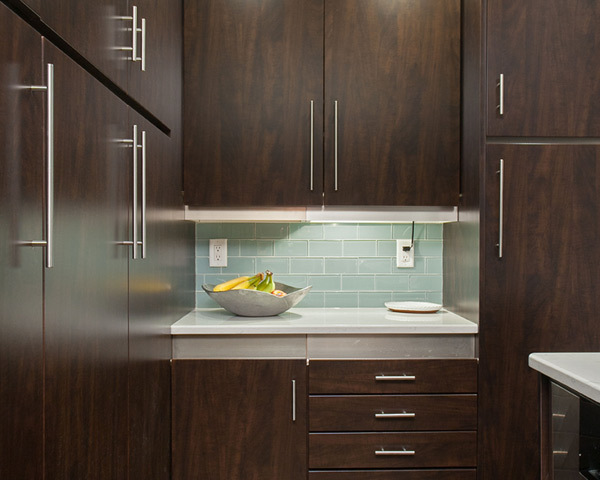 This kitchen's laminate cabinets feature our Hazlenut finish. It has a really nice luminosity that articulates the natural sheen that real wood can exhibit with certain finishes. There honestly isn't a wood that laminate can't successfully impersonate. We already covered white, but this example shows off the craftsmanship of the door by donning a rich black glaze. Cabinet glaze is a beautiful way to add visual interest, and make your laminate cabinets look even more like real wood. There you have it, 7 maintenance-free kitchen cabinets that are pretty much indiscernible from real wood. The finishes and colors available to you with laminate are plentiful, and if you have an option in mind, it likely exists. For advice from an expert design consultant, schedule a free in-home consultation. 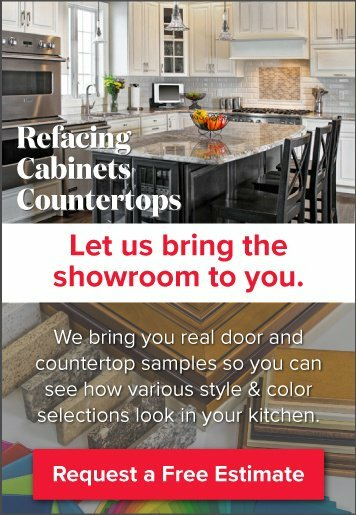 We'll bring the showroom to you and show you exactly how our products will look in your kitchen.